Okonomiyaki is a food. It is a Japanese food. It is a cross between an overfilled omelette or pancake or a very thick pizza; some heathens call it a Japanese pizza – and it is all of these, yet it is not – sort of. You decide. It is quite hard to say what it is, but despite not looking the best in my opinion, nor sounding the best when you look at the ingredients included, okonomiyaki is actually fantastic to eat, and yes you do come back for more. Just to help, here is how you pronounce it ok-o-no-mi-yaki, yes just how it looks. 1 Just to help, here is how you pronounce it ok-o-no-mi-yaki, yes just how it looks. 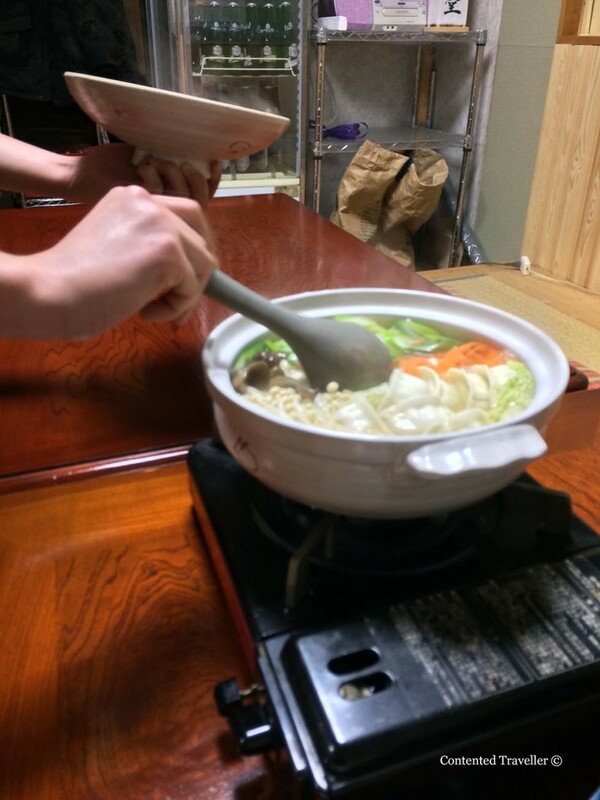 Now making an Okonomiyaki is theatre in itself, which adds to the enjoyment. As each Okonomiyaki chef is a specialist and proud of his version, you can see the intensity in the making of these very large meals. 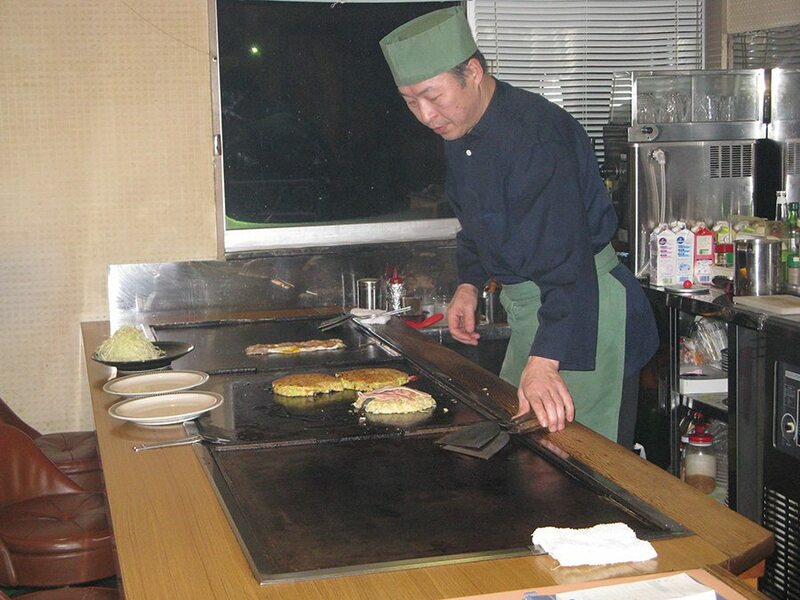 Okonomiyaki is served in many parts of Japan, each with there own take on it. 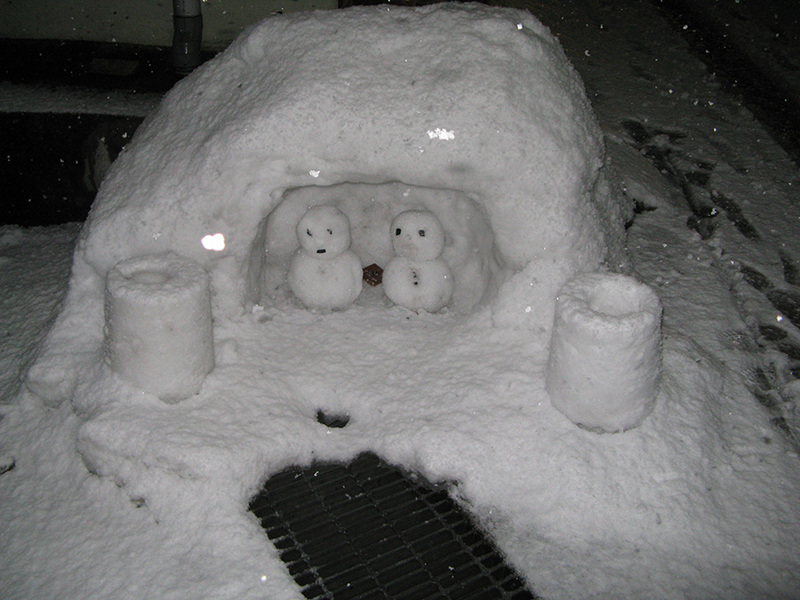 Our (repeated) experiences are from the village of Nozawa Onsen in the Nagano Prefecture. This lovely village has come onto people’s radar because of its unique powder skiing, but also because of its traditional Japanese village feel, its sensationally hot onsens, and its extremely good fresh food, not to mention that the villagers are just nice. Many of us, see it as a second home. So, Okonomiyaki literally means “as you like it” in Japanese. This means that whatever you wish to have in it you can and do. Okonomiyaki is very much made to person’s preferences, however there are 2 main styles of Okonomiyaki, the Hiroshima-style and Kansai-style. The Hiroshima-style okonomiyaki is layered like a giant omelette and often includes yakisoba, which is stir-fried boiled ramen noodles, vegetables and meat or seafood, sometimes with a fried egg on top. Kansai-style okonomiyaki on the other hand is mixed together before being cooked like a pancake. Then sauces are squirted across the top, like mayonnaise and a form of BBQ sauce. Yes, sounds good already doesn’t it? That is what we eat after a hard day of skiing. This is such an art form buy cialis in usa that you have specialist okonomiyaki restaurants where the chef cooks them in front of you. The meal is enormous, filling and delicious, just a bit ugly. 2. Mix “what you like” in with the batter (which is generally many things, not just a prawn one), but as I said many things. 3. Put onto a hot flat grill and shape in a circle with the correct tools. 4. Once one side of the okonomiyaki has been sufficiently cooked, use the spatulas to flip it. Make sure that the okonomiyaki has been cooked through enough to hold together. 5. When the okonomiyaki is cooked, add the toppings. This is where it gets worrying. 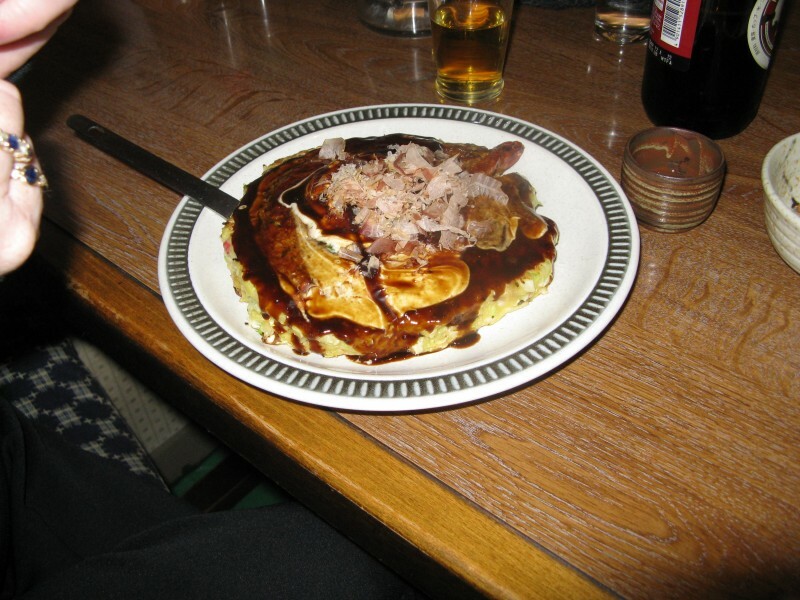 The first layer is the okonomiyaki sauce, which looks and tastes like Worcestershire sauce. The sauce needs to be ‘liberally’ applied to the Okonomiyaki with a brush. 6. Then comes the mayonnaise, which you apply in zigzagging lines. 7. Then add heaps of smoked bonito called katsuobushi using wooden tongs. Now bonito is the fish shavings and I am totally grossed out by them because they “MOVE” and “CONTORT” when put on the okonomiyaki. Drinking more sake will help. 8. Add aonori, a dried seaweed over the top of your Okonomiyaki. 9. Now, using the tools that you flipped and molded the Okonomiyaki with, cut into chunks and eat, washed down with copious amounts of saki. It does taste good and in theory, appears to be “good” for you. 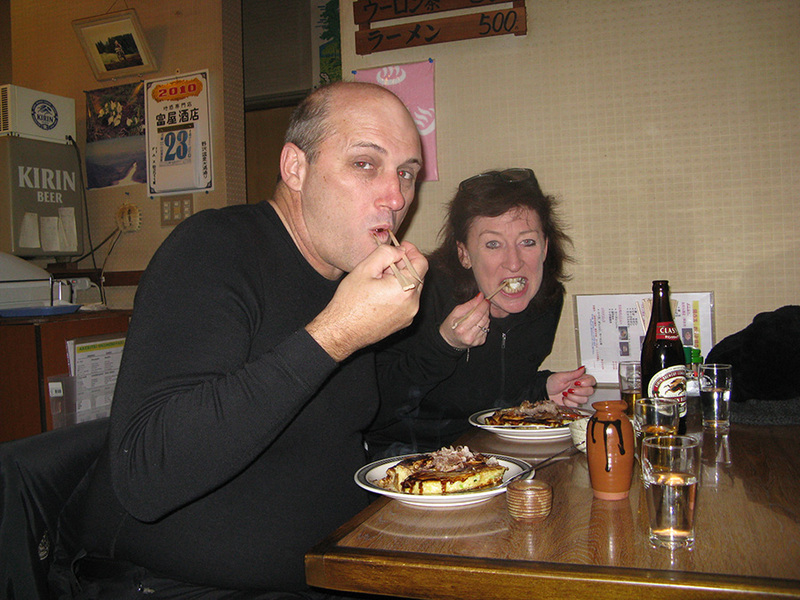 On the other hand you could just let the specialists do it and enjoy the theatre and the taste of the Okonomiyaki. Think its a sign, second post this morning with okonomiyaki. I want, I want, I waaaaaannnnnt! 🙂 I just read a post on how I can make it using ingredients sourced locally. Cant wait. It is a sign. Make sure you let me know when you have your first ‘okonomiyake experience’. It was a delicious discovery at an Osaka Izakura. So filling and different that the light, elaborate fare in other Japanese eateries. 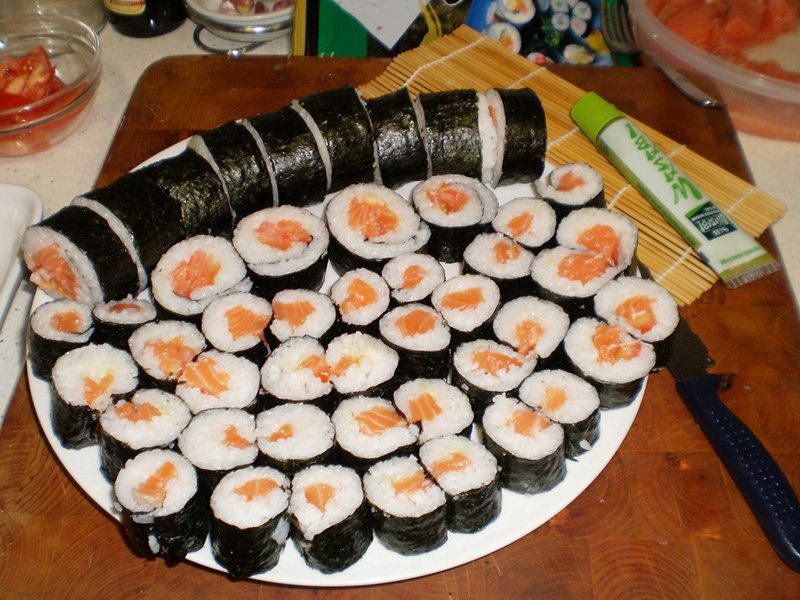 You are very correct, it is not a light dish in comparison to other Japanese dishes. Hmmmm… I was totally on board until I read about the contorting fish haha! For some reason, the addition of the cabbage made me think of bubble and squeak. No idea why! I know, i still freak out at the contorting fish. I don’t think I have ever had it. I will have to try it out. Do try it; it tastes better than it looks. Looks like a dish I would love! Especially if I get to choose my ingredients. It is great, and watching it being made is better. I have a youtube on it. You can never have too much okonomiyaki, don’t you think? I love it! I think I would be the side of a house if I had too much. 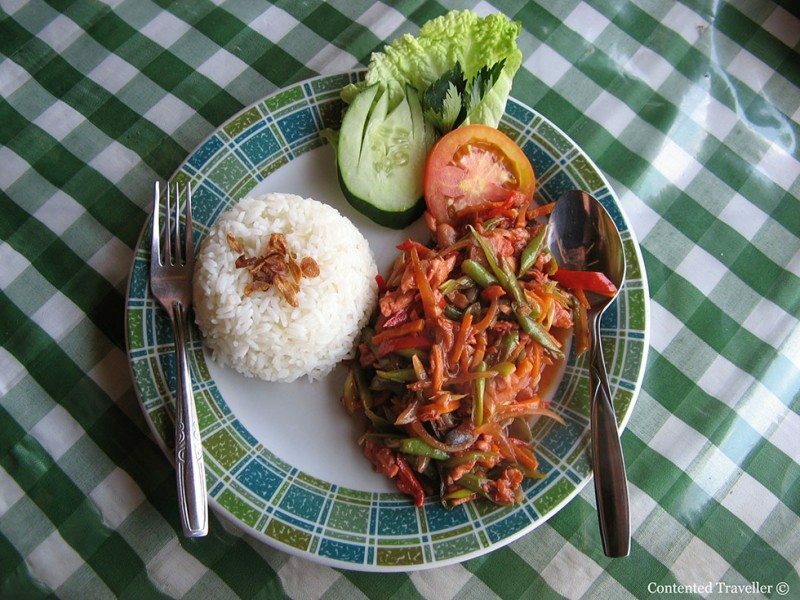 It is definitely enjoyable with the theatre that is involved in preparing this ugly food. I LOVE Okonomiyaki! Thanks for the story 🙂 It’s been a while since I’ve made it, I think you’ve brought my craving back! I love it too, and look forward to it every time we are in Japan.